Resin folding chairs give you the good looks of wood with the tough, fade resistant resilience of resin. When it’s gotta be extra special, like for a dream wedding, fundraiser, or Grandma’s 100th birthday party, these beautiful chairs make the right impression. You don’t have to worry about them getting ruined when you set resin chairs outside on balconies, patios or poolside. 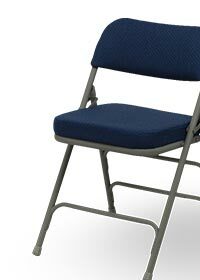 And most resin folding chairs have a 1000 pound weight capacity. HERCULES Series 1000 lb. Capacity Black Resin Folding Chairs with Black Vinyl Padded Seat, White Resin Folding Chairs with White Vinyl Padded Seat, Mahogany Resin Folding Chairs with Black Vinyl Padded Seat, White Resin Folding Chairs with Slatted Seat and Kids White Resin Folding Chairs with White Vinyl Padded Seat.